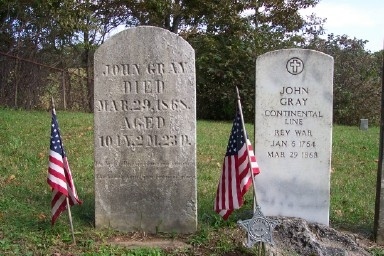 On this day in history, January 6, 1764, John Gray, the last living veteran of the Revolution is born. Gray was born near Mount Vernon, the home of George Washington. His father was an acquaintance of Washington’s and was killed at the Battle of White Plains in New York on October 28, 1776. John reported that his first job as a boy was working for George Washington and that Washington often greeted him in public, shook his hand and encouraged him. John was the oldest of 8 children and when his father was killed, the responsibility of providing for the family fell upon him. His family was very poor and often had only the rabbits John could catch as food to eat. Toward the end of the war, John joined the war and was present at Cornwallis' surrender at Yorktown. He was only 17 years of age and served in the army for six months. 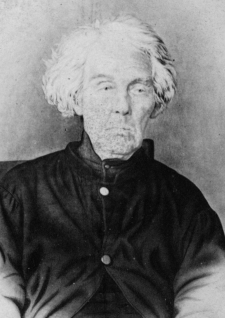 After the war, he married and eventually moved to the Northwest Territory, into what is now Ohio and lived in Noble County for the rest of his life. He died on March 29, 1868 at 104 years, 2 months and 23 days old, surviving three wives and all but one of his four children. Gray never received a veterans pension because his term of enlistment was too short, but about a year before his death, he was finally granted one by special act of Congress. At the time of his death, there was some controversy about exactly who was the last living veteran of the Revolution. Daniel Bakeman died in 1869, but was never able to conclusively prove that he had served in the war. (He married at 13 by the way and his wife was only 14!) George Fruits died in 1876 and was another contender, but there is now some question about whether he was mixed up with his father and actually died much earlier. John was a lifelong Methodist and a lifelong tobacco chewer. He sided with the Union during the Civil War and regretted that his home state of Virginia joined the Confederation. He died at the home of his daughter, Nancy McElroy in 1868 and is buried in the McElroy Family Cemetery at Hiramsburg, Noble County, Ohio.